← Field Note: AAR -SBL Annual Meeting a Reception for the Journal of Religion and Violence. In the aftermath of the Canadian election on October 19, which saw the long dormant Liberal Party rise to the position of majority government after nearly a decade of Conservative Party rule, much ado was made of the sea-change that took place in both tone and policies. 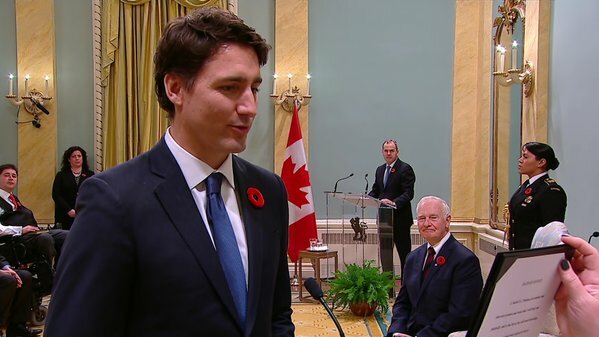 November 4th saw the swearing-in of Prime Minister Justin Trudeau, along with his new 31-member cabinet, which the PM promised would be gender-balanced. While there was much attention given to Trudeau’s response to why he chose gender parity in his cabinet (“Because it’s 2015,” he bluntly declared at a press conference), comparatively little was mentioned about the swearing-in ceremony itself—a rather drab, ceremonial process that (I imagine) many Canadians ignore, to say nothing of Americans, for whom Canadian politics does not exactly register as prime time. However, given the controversial policies of the former Harper government on the world stage (e.g., for its position on climate change), including their use of the niqab as a wedge issue throughout the recent election campaign, and the flurry of attention given to the new Prime Minister’s physical appearance, described by some foreign media as “super hot,” there seemed to be unprecedented attention to Canadian politics in the US, as attested by comments from many of my own American Facebook friends, and by the coverage on US talk shows, such as Last Week Tonight with John Oliver, and in other mainstream media. Meanwhile, we get excited in the U.S. when a member of Congress takes an oath on anything other than the Bible. Stop showing off, Canada. You’re embarrassing us. Mehta is the editor of the “Friendly Atheist” portal on Patheos, which presents itself as a hub for inter-faith discussions. As a scholar of religions who holds Canadian citizenship, currently lives in Canada, and has followed Canadian politics for some time, a few things struck me about Mehta’s post. First, while it is not at all surprising that a self-described atheist writing on issues of atheism and religion in the public sphere would be enthused by this development, the story’s lack of attention in Canadian media (I could not find a single source that was critical, while only a few mentioned it in passing) reflects not only a different style of politics between the two countries, but, I would suggest, a relative absence of mainstream journalism in Canada that looks to make hay out of divisive wedge-issues on matters of “culture.” Apart from the short-lived Sun TV News Network (commonly dubbed “Fox News North” by detractors), which thrived on culture politics in the interest of shaping a particular Canadian identity, the mainstream press tends not to “go there,” as witnessed, for example, by their overwhelming opposition to the recent niqab issue (see my post on this issue here), despite national polls showing high support for the Harper government’s proposed ban on the niqab in swearing-in ceremonies for Canadian citizenship. One question that this raises in need of more empirical data and analysis is the role of national media in both shaping public sentiments (e.g., there was very little attention to the niqab issue prior to late January 2015, save for related issues on veiling in Québec), as well as failing to reflect a spectrum of public opinion on entrenched ideas and changing demographics. It is not at all clear, for example, what Canadians think about atheists, not least because it has never been an expedient political football, at least not in recent decades, and as the “communist threat” has largely faded from popular memory. I, [name], do swear that I will be faithful and bear true allegiance to Her Majesty Queen Elizabeth the Second, Queen of Canada, Her Heirs and Successors. So help me God. Having grown up in the 80s and 90s in Toronto, and having lived in different cities around the country, I can attest anecdotally that the Queen is rarely (if ever) mentioned in any context by anyone under 50, save for the hype surrounding royal visits, which also occur in the US. Part of the reason for this, I would suggest, is that “the Queen” lacks not only actual power today (after all, the sun set long ago on the British Empire), but symbolic power as well. While former generations would have listened to royal proclamations on the radio, used the Union Jack as their flag (changed to the Maple Leaf in 1965), and, up until the Constitution Act in 1982, required the monarch’s “Royal Assent” when enacting legislation, for those who were born after 1970, such fixtures of actual power were all but removed from popular imagination. Attempts to reinvigorate Royal ties by the former Harper government, such as the decision to restore the word “Royal” to the air force and navy, seemed to fall flat, as a recent report suggests (see page 20). While there are some media figures on the margins that still try to promote royal ties, such as former Sun TV News anchor Brian Lilley, very few seem to take notice, save for some First Nations communities, who aim to draw attention to these historical links as a way to remind the government of various Treaties that were signed (and often violated). Tying these two themes together, it strikes me that the guiding sentiment for most Canadians when it comes to the oath to God or Queen is one of apathy. Without any real or symbolic power at stake, such ritual performances pass largely unnoticed (unless they stand out by comparison, as was the case with Mehta’ s post), which calls to mind two theoretical points of interest that are worth further consideration. First, what are the conditions of apathy toward symbols and what are the effects of their persistence long past the time that they hold any real power? Second, what does the decision not to invoke God in the oath of office, while casually invoking the Queen tell us about an individual’s intentions when performing speech acts? While the former example may constitute a preference for atheism, or perhaps a rejection of a particular Christian valence (especially among Indigenous Ministers given the legacies of colonialism, such as forced conversation and Residential Schools), and appears to be an intentional act, the latter may mean nothing at all to many of the oath takers, especially when such words, disconnected from any tangible consequences, have melted into air. This entry was posted in Matt Sheedy, Politics and Religion, Religion and Society, Religion and Theory, Religion in the News, Theory in the Real World, Uncategorized and tagged Atheism, Brian Lilley, Constitution Act, Friendly Atheist, Hemant Mehta, John Oliver, Justin Trudeau, Last Week Tonight, niqab, Patheos, Stephen Harper, Sun TV News, Union Jack. Bookmark the permalink.